The hubby and I recently returned from our one week trip to Mexico. This was our first trip to Mexico and we had a blast! I know I had a TON of questions about traveling to Mexico before we went, so I figured I would create this post to help answer questions you may have about traveling to Cancun. Keep reading to find out what we did, where we stayed, and our overall thoughts about our Mexico travels! These are my top Cancun Mexico travel tips. Why did you choose Cancun Mexico? We chose Cancun for several reasons. Neither of us had been to Mexico and wanted to experience what an all-inclusive was like. Mexico is warm and the Cancun side has great beaches and warm water. It was fairly inexpensive. Thanks, Costco! We booked through Costco Travel which I highly recommend for an all-inclusive to a country you’ve never been to before. They get you a killer deal and ALL your transportation is included. Where did you stay in Cancun? We stayed at Hotel Marina El Cid Beach Resort and Spa in Puerto Morelos. The hotel itself was really nice and clean, the staff was very friendly, and the food was great! It had beautiful gardens and several pools. The beach wasn’t overly crowded and we had fun walking to the marina to see the dolphins each night. They had a really nice gym which I loved! We usually had it all to ourselves. They also offer fitness classes throughout the day which was cool. They had several themed restaurants including French, Italian, Seafood, Mexican, and Mediterranean. They were all really good, but really heavy. I enjoyed myself but was happy to get back to my green smoothies! They also had a really good taco bar for lunch and plenty of fresh fruit. We only drank bottled water, but if alcohol is your thing, there is plenty of it! How was the beach in Cancun? The beach at our hotel was decent. If you’re looking for a beach with amazing snorkeling or waves to play in, this is not the beach or hotel for you! It definitely had a seaweed problem at the end of our stay, and I don’t mean just some seaweed floating in the water or some on the beach. I mean the whole beach/bay was covered in seaweed which resulted in a horrific smell. It didn’t ruin our stay at all, but we did wish the beach had more to do. Just do your research before you go and make sure the beach where you are staying is what you would enjoy. Did you do any excursions outside of the hotel? We decided to do two excursions, both we booked through our hotel. They were relatively inexpensive and provided transportation to and from the hotel. I definatley recommned booking through your hotel or a reputable tour company so you don’t get ripped off. Or kidnapped. The first excursion we did was the Cenotes Adventure tour. (Through the tour company Xenotes). We LOVED this mini adventure. If you like exploring your natural surroundings, love water and don’t mind heights, you’ll love it too. On the tour, you’ll visit four different cenotes, each with a different way to explore them. We got to rappel, zip line, snorkel, kayak, and swim! The water in Cenotes is very clean so you don’t have to worry about getting a bug like you would a dirty river. I wouldn’t worry about putting on a ton of sunscreen or bug spray before because they have you shower before you enter the cenotes. The cenotes actually provide drinking water to local villages so they keep it as free from chemicals as they can. The second tour we did was a catamaran/snorkeling tour to the reef just out from our beach. This was a great way (and probably one of the only ways) to see the protected national reef. We were provided with life jackets, clean snorkel masks, and a guide and had about an hour to explore the reef. Normally, I HATE snorkeling with a life jacket. But since parts of this reef were pretty shallow and you aren’t allowed to touch anything, I can see why they require one. We saw some beautiful coral formations, fish, a barracuda, and held a starfish! We then enjoyed about another hour of sailing off the coast then headed back to our hotel marina. We never felt unsafe during our trip to Mexico. That being said, we didn’t venture into any sketchy areas or out on our own. We just didn’t want to risk getting lost because neither one of us were familiar with the area. I once heard a travel agent put it this way and I agree 100%. Mexico has safe areas and unsafe areas just like the US has safe places and not so safe places. You wouldn’t wander into a scary neighborhood of downtown Detroit, so don’t do that in Mexico or anywhere you travel to! Do some research and find out where and what you’re most comfortable with. Certain places and areas of Mexico are way more dangerous than others. The US Department of State/Travel gives frequent updates on ALL countries, so you can always check that. Overall, Cancun is a generally safe area. Stay with groups, don’t venture far on your own, and be smart. You’ll be just fine! Would you go back to Mexico? We really enjoyed ourselves in Mexico and it was a perfect worry-free relaxing vacation. We were glad we experienced an all inclusive so we could see what it was like. It was definitely nice not having to worry about meals or getting ourselves to the beach. I don’t know if we will go back to Mexico, there are just too many other places in this world to explore! And since Jonny and I are more of the adventurous type, we got a little bored since our beach was kinda dull. At times I felt a little trapped in the hotel. Normally I like to venture out into town, but we weren’t really in an area where that was an option. Overall, I would highly recommend a trip to Cancun if you’re looking for a warm, tropical getaway to some beautiful ocean views for a relatively affrodable price. DON’T drink the tap water! Even if your resort says it’s safe, it’s not. The ice is supposedly filtered, but we still tried to avoid it. You’ll get plenty of free bottled water if you choose to do an all inclusive so just don’t risk it! It’s fine to shower in, but we used bottled water to brush our teeth and drink. I even avoided fruits and veggies that would be washed in water. We didn’t get sick at all during or after our trip, but I hear it’s common to pick up bugs at places like these. Don’t forget your passport! And lock it away as soon as you get to your hotel. You won’t need it until you leave and you do NOT want to lose it! You’ll also get a customs paper to fill out on the plane from the Mexican government. Fill it out and keep it with your passport. You’ll need it to get on your return flight home and if you lose it you’ll have to pay to replace it. Bring plenty of sunscreen and sun protection. The sun in Mexico is STRONG and it’s expensive to buy sunscreen at the resort. Here is my favorite vegan sunscreen I used on the trip. Relax and have fun! Take advantage of the all inclusive if that’s what you go for. Order room service one night, enjoy the food, go on some excursions, and explore what the area has to offer! There you have it! Hope you found my top Cancun Mexico travel tips helpful! 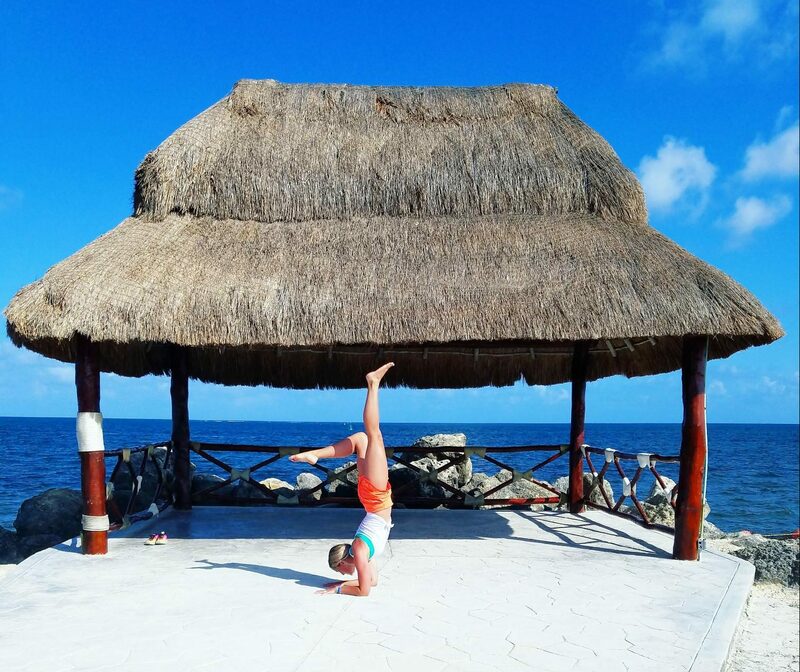 If you’d like to read my top tips for staying healthy and fit while traveling, click here.